Our friends at All Arsenal have produced this in depth match report from Arsenal’s 1-1 draw with Norwich, including highlights and goals from the game. We missed our chance to move up the table once again, with a disappointing draw against Norwich meaning we’re still stuck in fourth behind Manchester United, Leicester City, and Manchester City. After a poor November in the Premier League we needed to bounce back from the West Brom defeat, and it looked at first as though we were going to do exactly that. We lost Laurent Koscielny early on to a rather worrying looking injury, with the French defender pulling up holding his hip. 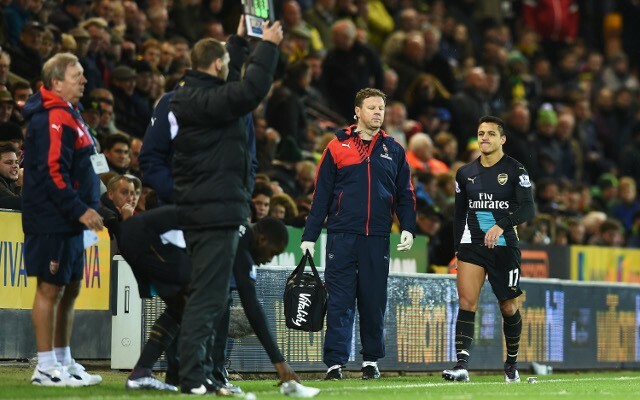 He was replaced by Gabriel Paulista, a substitute that proved costly. We were dominating the ball predictably, but weren’t creating a huge amount of clear cut chances. Some great attacking build up saw Mesut Özil gifted a chance by Nacho Monreal, but his first time shot was deflected high and wide by Sebastian Bassong. Alexis Sanchez was the next to get a real chance – with a mazy run by Santi Cazorla leaving the Norwich defence dazed and confused – but his shot from a tight angle was blocked by John Ruddy. We eventually took the lead on the half hour mark, and it was our man of the moment Mesut Özil who got the goal. Alexis Sanchez pounced on a poor clearance from Ruddy, quickly playing Özil through on goal. Ruddy raced out to make amends, but our German playmaker chipped him beautifully to make it 1-0. We should have continued to dominate the ball and made sure we saw out the half, but as we’ve done so often recently we conceded a soft goal. Per Mertesacker and Gabriel failed to step up when they should have, with Lewis Grabban foolishly played onside. Gabriel was then caught out of position when the ball came in, and the Norwich striker was given far too much time and space to control the ball, move it into space, and shoot past Petr Cech. 1-1. The goal came at a terrible time, and we went into the break with honours even. We were visibly impacted by the goal, and our game noticeably dropped. We looked frustrated, tired, and Norwich looked far hungrier for the win. We were still creating half chances through Mesut Özil, but there was a constant fear of conceding. Mathieu Flamini just wasn’t offering the protection Francis Coquelin normally does, and injuries continued to play their part. We then got the worst injury of all, one we’d all been fearing for weeks. Alexis Sanchez pulled up clutching his hamstring, and clearly the issue he picked up against Dinamo Zagreb was a serious one (via the Mirror). The Chilean limped off, and there’s no telling how long we’ll be without him now. Arsene Wenger was aware of the problem, and has been punished for not resting our star forward. Cech made a match saving supersave, reacting superbly to palm the ball round the post. The ball came off Gabriel, but the Brazilian knew very little about it. The defender made up for his earlier mistake somewhat by making a superb clearance, and without his intervention there would have been a tap in. We looked more likely to concede than score late on, and Norwich looked dangerous on the counter. We looked out of ideas, and resorted to throwing balls into the box for Olivier Giroud – most of which were pretty poor. We dropped so badly after the goal, something you can’t afford to do. We didn’t deserve to win the game, but the main thing we’ll take from it is the injuries. We are still just two points off top spot, but without Alexis Sanchez and Laurent Koscielny should we be more concerned with Tottenham behind us in fifth?